"Walton's Mountain by day was friendly, but by night ghosts seemed to hide in every shadow and the feeling of something old and mysterious flowed downward on the cold night wind. And if we were walking homeward past a house that was known to be haunted, you couldn't help but be a little apprehensive." John-Boy walks past the old Pendleton house and sees a moving candle in the window. His father and him go back after dinner to investigate. They find Dave Pendleton's daughter Jenny inside. Her father has remarried after her mother passed away. She has run away while her father is on his honeymoon. She desired to see the home that she was born in after reading some letters that her mother had written about the place. The Walton's offer to take her in and she revels in the love that the family has for each other. Being a single child she wishes that she could belong to a large family like the Waltons. She offers to earn her keep by doing household chores and she looks forward to helping and spending time with each member of the family. When she visits John-Boy in his room she asks him to play the Appalachian dulcimer that he has borrowed from a neighbor who makes them. Later while the family listens to the radio Jenny's father arrives with her new step mother. They announce that they plan to open up the old house and they will stay as long as their daughter desires. The next morning John-Boy takes Jenny up the mountain and shows her the remains of the original pioneer homestead of Rome and Rebecca Lee Walton. When they pretend what live must have been like for them in those days they end up in each others arms and share their first kiss. They love affair continues until her father is killed in a highway accident. She becomes bed ridden and unresponsive. Doc Shackleford says that she has put herself in a state of denial and that she needs times to break free from it's grip. It is not until she hears the Walton's saying goodnight to each other that she finally awakes from her state. After some time she prepares to return to Richmond with her step-mom who had been recovering in hospital since the accident. She meets John-Boy at the old homestead and gives him the finest dulcimer that old man Dawson has made. Jenny waits to the last minute to tell him that she is going to leave. She wanted to keep their final days together happy ones. They make promises to stay true to each other until they see each other again but young love does not always last. Mary Ellen is growing a jar of tadpoles into some frogs in hopes of selling frog legs to fancy restaurants. She figures that her 300 tadpoles will earn her $650 million dollars. When the tadpoles mature into frogs she is surprised to learn that she had grown tree frogs and her plans for riches has all hopped away. "Jenny was to come into our lives again, but the promises we made to each other we were not to keep. Still, her name and her face are remembered in our house and the memory of Jenny is as sad and as sweet as the cry of a nightbird drifting across the new green fields of spring." 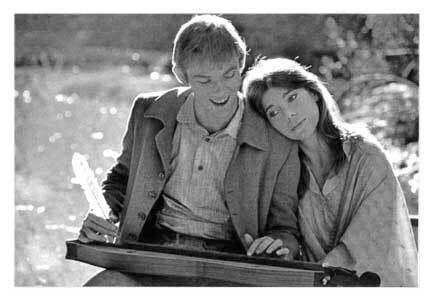 Richard Thomas plays the appalacian dulcimer and sings a love song in this episode. Jenny and her mother appear again in "The Thanksgiving Story" (s2-ep10). Chance the cow is about 2 weeks from birthing a calf. This episode was nominated for two Emmy awards: one for Lee Philips as best director and the other for Earl Hamner Jr. as best writer. Richard Thomas and Sian Barbara Allen were dating during this period. They starred together in the 1972 thriller You'll Like My Mother with Patty Duke. Read more about their relationship in this article. John-Boy plays the Appalacian Dulcimer and sings a song for Jenny. Reprise of John-Boy's love song during Jenny & John-Boy's love affair sequence.